Tackle is a playing position in American and Canadian football. Historically, in the one-platoon system a tackle played on both offense and defense. In the modern system of specialized units, offensive tackle and defensive tackle are separate positions. The offensive tackle (OT, T) is a position of the offensive line, left and right. Like other offensive linemen, their job is to block: to physically keep defenders away from the offensive player who has the football and enable him to advance the football and eventually score a touchdown. The term "tackle" is a vestige of an earlier era of football in which the same players played both offense and defense. A 2006 book by Michael Lewis, The Blind Side: Evolution of a Game, sheds much light on the workings of the left tackle position. The book discusses how the annual salary of left tackles in the NFL skyrocketed in the mid-90's. Premier left tackles are now highly sought after commodities, and are often the second highest paid players on a roster after the quarterback; in the 2013 NFL Draft three of the first four picks were left tackles, and usually at least one left tackle is picked in the first five positions. Recent examples include Eric Fisher (2013, 1st overall pick), Luke Joeckel (2013, 2nd overall pick), Lane Johnson (2013,4th overall pick), Matt Kalil (2012, 4th overall pick), Trent Williams (2010, 4th overall pick), Jake Long (2008, 1st overall pick), and Joe Thomas (2007, 3rd overall pick). A defensive tackle (DT) is typically the largest and strongest of the defensive players. The defensive tackle typically lines up opposite one of the offensive guards. Depending on a team's individual defensive scheme, a defensive tackle may be called upon to fill several different roles. These roles may include merely holding the point of attack by refusing to be moved or penetrating a certain gap between offensive linemen to break up a play in the opponent's backfield. If a defensive tackle reads a pass play, his primary responsibility is to pursue the quarterback, or simply knock the pass down at the line if it's within arm's reach. Other responsibilities of the defensive tackle may be to pursue the screen pass or drop into coverage in a zone blitz scheme. In a traditional 4–3 defensive set, there is no nose tackle. Instead there is a left and right defensive tackle. Some teams especially in the NFL do have a nose tackle in this scheme, but most of them do not. Nose tackle (also nose guard or middle guard) is a defensive alignment position for a defensive lineman. In the 3–4 defensive scheme the sole defensive tackle is referred to as the nose tackle. The nose tackle aligns across the line of scrimmage from the offense's Center (American football) before the play begins in the "0-technique" position. In this position, frequently taking on the center and at least one if not both of the guards, the nose tackle is considered to be the most physically demanding position in football. In five-linemen situations, such as a goal-line formation, the nose guard is the innermost lineman, flanked on either side by a defensive tackle or defensive end. According to Pat Kirwan, a traditional 3–4 defense demands "a massive man who can clog up the middle," while a 4–3 defense is looking for "a nose tackle who relies on quickness to penetrate and move along the front." Typical 3–4 nose tackles are "big wide bodies who can hold the point of attack and force double teams by the guard and Center (American football)." They are usually the heaviest players on the roster, with weights ranging from 325 to 375 pounds (147 to 170 kg). Also, height is critical, as they are supposed to get "under" the offensive line, which means ideal 3–4 nose tackles are no taller than 6 ft 3 in (1.91 m). Recent examples of such nose tackles include Ron Simmons, Jamal Williams, Casey Hampton, and Vince Wilfork. 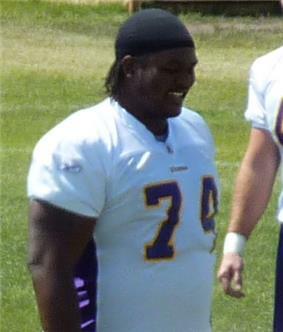 Rather uncommon are taller nose tackles, such as Ted Washington and Kris Jenkins, both 6 ft 5 in (1.96 m) tall. In some 4–3 defensive set, the nose tackle is one of two defensive tackles. Some teams especially in the NFL do have a nose tackle in the 4–3 defensive set, which lines up against the opposing center and very likely the weak-side or pulling guard. In a 4–3 defensive set, nose tackles are rather quick and supposed to "shoot the 'A gap' and beat the center and very likely the weak-side or pulling guard into the backfield." Height is not as important, and their weight is closer to 300 pounds (136 kg). The terms "nose guard" or "middle guard" were more commonly used with the five-man defensive line of the older 5-2 defense. Effective against most plays of the day, but with a weakness to the inside short pass, the 5–2 was phased out of the pro game in the late 1950s. In the 4-3 defense, the upright middle linebacker replaced the middle guard. The nose guard is also used in a 50 read defense. In this defense there is a nose guard, two defensive tackles, and two outside linebackers who can play on the line of scrimmage or off the line of scrimmage in a two-point stance. The nose guard lines up head up on the center about six to eighteen inches off the ball. In a reading 50 defense, the nose guard's key is to read the offensive center to the ball. In run away, the nose guard's job is to shed the blocker and pursue down the line of scrimmage, taking an angle of pursuit. The primary responsibility of the nose tackle in this scheme is to absorb multiple blockers so that other players in the defensive front can attack ball carriers and rush the quarterback. ^ Rush, Nathan (February 8, 2008). "NFL Draft — Defensive Tackles". Athlon Sports. ^ Dillon, Dennis (October 11, 2004). "Getting their nose dirty".